When is a rail pass cheaper than a point-to-point train ticket? Do I need a German rail pass or an European rail pass? 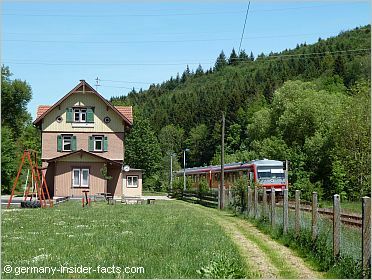 An Eurorail Pass or a German Rail Pass can save you a lot of money on your German train journey. Get all the details and find the right train pass. Before you look at available pass options, you should know how many days you want to travel by train. You also need to decide if you want to be flexible or have a fixed schedule while you travel in Germany by train. Let me give you an example: The standard fare one-way ticket from Munich to Berlin varies from €121 to 135 € in the second class. You can reduce this price to €89 or even €69 if you book a week or more in advance. The super cheap tickets are train specific bookings, and subject to availability. Don't be surprised to find different prices for different trains on the same route throughout the same day. Prices depend on several factors, demand and train type are two of them. So if you are willing to hunt for those cheap tickets weeks in advance and give up flexibility while you travel, you don't need any train passes. However, if you want the freedom to change your plans while you travel, a German Rail Pass or any other Eurorail Pass is your chance to save money. How does a rail pass work? The range of train passes for Germany and Europe is quite overwhelming. The good news is that you can purchase all passes through one company. Rail Europe is a company with more than 75 years of experience selling Eurail and national rail passes for Germany and other European countries. In many countries around the world you can purchase eurail passes before you leave home, and pay in your own currency. If your travel itinerary is already fixed, you can even purchase seat reservations from home. Of course, this would spoil the flexibilty advantage of any pass. You can easily make seat reservations online a couple of days in advance. Reservations are only possible for long-distance trains. RailEurope passes are only available for residents outside Europe. European citizens who have been living for more than six months outside Europe can buy a rail pass. You can buy your pass up to 6 months in advance. Rail passes must be validated within 6 month of the date of purchase. If you validate the pass a day before the 6 months end, the pass is still valid for the purchased timeframe. Validate your pass before you travel by train the first time. Just go to a counter or travel centre at a railway station and an officer will stamp your pass and include the day of your first journey. For the rest of your travel days don't forget to write down the date of the day you are travelling before you board the train. If a conductor checks your rail pass and the date of the day is not included, you are travelling without a valid ticket and risk a fine. You need your passport as well to prove that you are the holder of the train pass. Some overnight trains require that you use two travel days. Passes for train journeys within one country are usually valid for one month. You can purchase from 3 to 10 travel days. An Eurorail Pass to travel in 3, 4, or more countries in Europe is usually valid two months, and you can buy more than 10 travel days. Rail and Drive passes - purchase a certain number of train travel days and days for using a hired car. This is pretty convenient when you want to explore the rural areas surrounding a big city. Train travel in Germany is really the best way to enjoy the beautiful scenery in my country. If you want to criss-cross Germany by train, and want to explore several regions and cities, it is really worth to consider to purchase a German Rail Pass. The map shows you just the InterCityExpress network. 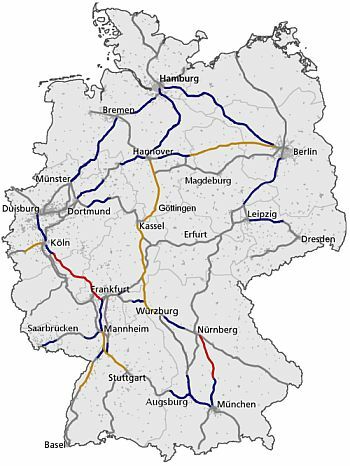 RegionalExpress and RegionalBahn trains bring you to nearly every corner of Germany. Anyway, a German Rail Pass offers you unlimited train travel per train travel day on all trains operated by the Deutsche Bahn. From the high-speed ICE trains to the S-Bahn in regional centres, you can spend the entire day on trains. Of course that's not what you intend to do, but you get the idea. 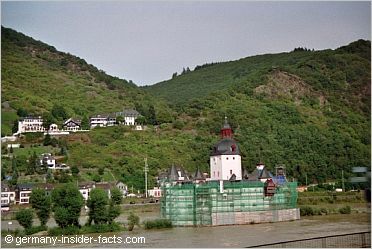 Travel from the Alps to the Baltic Sea, explore German castles and the beautiful Rhine valley. Plan your itinerary and decide how many travel days you need. 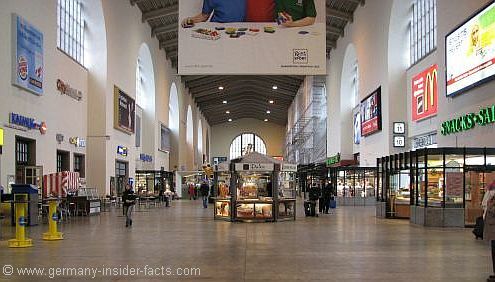 The German Rail Pass lets you travel to Salzburg in Austria and Basel in Switzerland as well. Travelling with your partner? A Twin Pass saves you even more money. The German Rail Pass is available for first and second class travel. Children under the age 6 are free, kids from age 6 to 11 get a 50% reduction. The Youth Pass is for the youngsters from 12 to 25, and only for the 2nd class. The German Rail pass does not cover seat reservations, although I would highly recommend to make reservations for the InterCityExpress trains. It is not that expensive, but your own seat really makes the difference in a full train. Once you know your travel date, you can purchase a seat reservation ticket from any railway station in Germany, or online from the Deutsche Bahn website. You'll get several bonuses & reductions with your rail pass, for example free transport on cruises of the Koln-Dusseldorf Rheinschiffahrt AG Line. However, a free bonus will use a travel day, so check if its worth to use that bonus. The Eurail Selectpass lets you travel in Germany plus 3, 4 or 5 bordering countries. From Germany you can visit these countries with the Eurail Select Pass: Austria, Benelux, Czech Republic, Denmark, Finland, France, Sweden, Switzerland. The Eurail Select Pass is only available for 1st class travel. Travel in luxury for affordable prices. For people aged 12 to 25 a Youth Pass in the 2nd class is available. Too much to see in one holiday you think? You can also get passes that let you travel in Germany and one other European country. Multiple Country Passes , just select Germany as the first country, and add any other destination you want to see. Browse around the RailEurope website and find many more Eurorail Pass details to plan an itinerary for your Germany/Europe trip of a lifetime.